How does slowing down fit with autism treatment? I’ve been thinking about the topic of slowing down a lot lately (and not just in my own personal life) – should slowing down be a part of our autism treatment? As a society, we seem to be moving faster and faster each day, month, year. At the same time the word “mindfulness” is blowing up everywhere because we all know it! Life is getting away from us all! Our lives our overscheduled, our kids are overscheduled, we are multi-tasking more than ever and eventually things just start to feel like they are spinning out of control! As a RDI parent and professional, the topic of slowing down is a critical key component in remediating autism and creating quality of life for the whole family. It’s essential! You may be reading this and thinking “what the (bleep) does slowing down even mean? Are you crazy? Why would I do that?” Well, to illustrate my point I want to share a few quotes, a song and an AHA! moment I had with you in hopes that it might connect for you. “In order to speed up (development) you need to slow down” (to lay the foundations necessary to withstand all the challenges that life brings). “Remediating autism is a marathon, not a sprint” – this means that families will take the time they need to in order to support their kids with where they are at and caregivers need to prepare for the journey and take care of themselves too! The minute I heard this song, “Slow Down” by Indie Arie, I thought about my life parenting two kids with special needs – it totally resonated with me. Bonus – it’s super catchy! You can read the entire lyrics here https://genius.com/Indiaarie-slow-down-lyrics). 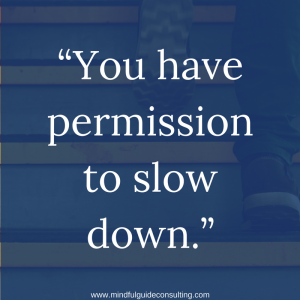 I’ve even shared this on occasion with my clients to help them be more mindful about going too fast and that slowing down will help them to re-align their priorities for the children as well as regain a sense of well-being for the whole family. These words from the chorus remind me to take advantage of the present, reflect on the past in order to figure out where to go in the future! My “AHA” moment went like this, as a parent of 2 children with special needs I have ‘been there, done that!’ Prior to discovering RDI I was doing way too much to try to help my kids. I felt like all their various therapies and programming equaled at least 4 part-time jobs! We were all overwhelmed, and worse, I was not able to analyze what was helping and what was not. One day I had an “AHA” moment…. I said to myself “I’m doing TOO many things and I can’t do any ONE OF THEM WELL!” Too many things left me feeling really incompetent. Too many things also sabotaged my experience to truly be a parent and for my kids to be kids. My kids weren’t thriving, they were too busy to make sense of their world, assimilate and integrate new meaningful information. RDI was the first step in changing things for me and my family. For the first time EVER, I was granted the permission to do less, not more! Before RDI, all the well intended professionals that I had encountered recommended “the more – the better”. Not so! I was disempowered as a parent functioning in that capacity. I wasn’t a parent , I was a chauffer, a web crawler, a scheduler, a note-taker, a sideline pitch hitter that wanted to play, a fireman (yep – putting out fires). I was reactive – not pro-active, I was exhausted, over-reliant on others and scared. Scared for my kid’s futures. One of the first tasks I had as an RDI parent was to slow down. Hmmmm, this was against everything I had learned up until then. Didn’t all these other professionals know better than me? As I let the idea sink in, it made buckets of common sense! How could my kids learn when they were constantly being assaulted with demands and over-schedules – their amygdala’s were being hijacked, they were in a constant state of survival and fight or flight. Kids with challenges need MORE time to process their world than typically developing kids, but yet kids with challenges are often busier. This revelation of slowing down became music to my ears. Now that we had space in our schedules I was learning how to mindfully take moments to optimize meaningful experiences in everyday life to truly become the agent of change for my kids and they started to thrive! Our family life was restored. Here’s an oxymoron folks – my life became about the journey not the destination, the process not the product, we kept our eyes on the prize as we slowed down and 14 years later we arrived at the destination I always dreamt about! My hopes and dreams for my kids have come true. I’m no longer scared, I can finally sleep at night and I know that my kids have quality of life! Over the years I’ve been asked many times by parents and other professionals this question, “what type of child is RDI best suited for?” My answer? “All children, it’s just really good mindful parenting. RDI helps restore the role of the parent”. Isn’t that why we became parents? Because we wanted to BE parents. Having a child with special needs shouldn’t change that! I’ve also been asked “What type of child does RDI NOT work for?” I’ve reflected on that question a lot of the years and my answer is still the same. My response is this, “RDI does not work for those families, where parents won’t slow down to do the work.” I don’t think it’s ever for lack of want, it’s more complicated than that. Think about slowing down – does it sound indulgent or refreshing? Does the thought evoke feelings of panic or relief? What might you do to create space for you and your child? What little steps can you take this week to do less? Watch for future articles on learning how to slow down, set priorities and taking care of you! For now I will leave you with this, “You have permission to slow down.” You will thank yourself and your children will thank you.